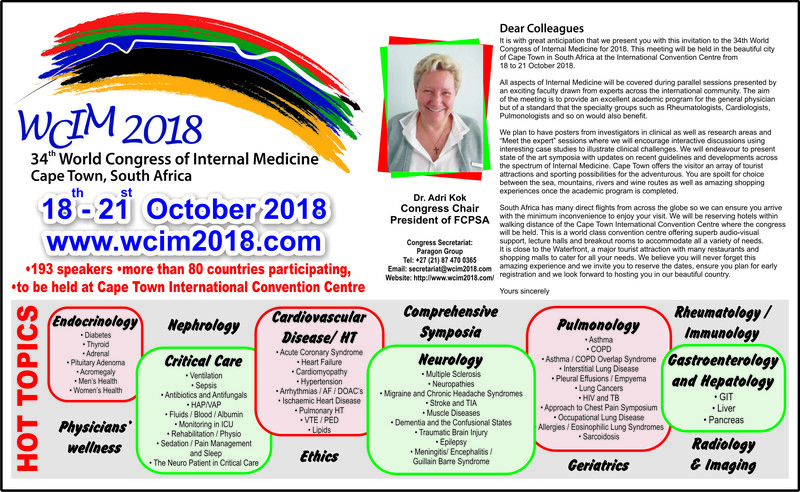 It is with great anticipation that we present you with this invitation to the World Congress of Internal Medicine for 2018. This meeting will be held in the beautiful city of Cape Town in South Africa at the International Convention Centre from 18 to 21 October 2018. All aspects of Internal Medicine will be covered during parallel sessions presented by an exciting faculty drawn from experts across the international community. The aim of the meeting is to provide an excellent academic program for the general physician but of a standard that the specialty groups such as Rheumatologists, Cardiologists, Pulmonologists and so on would also benefit. We plan to have posters from investigators in clinical as well as research areas and “Meet the expert” sessions where we will encourage interactive discussions using interesting case studies to illustrate clinical challenges. We will endeavour to present state of the art symposia with updates on recent guidelines and developments across the spectrum of Internal Medicine. We believe you will never forget this amazing experience and we invite you to reserve the dates, ensure you plan for early registration and we look forward to hosting you in our beautiful country.